A FIGHTING second half comeback by Dumbarton at Starks Park, Kirkcaldy, came so close to earning them a deserved draw. A FIGHTING second half comeback by Dumbarton in front of a 1,636 crowd at Starks Park, Kirkcaldy, came so close to earning them a deserved draw with Raith Rovers. 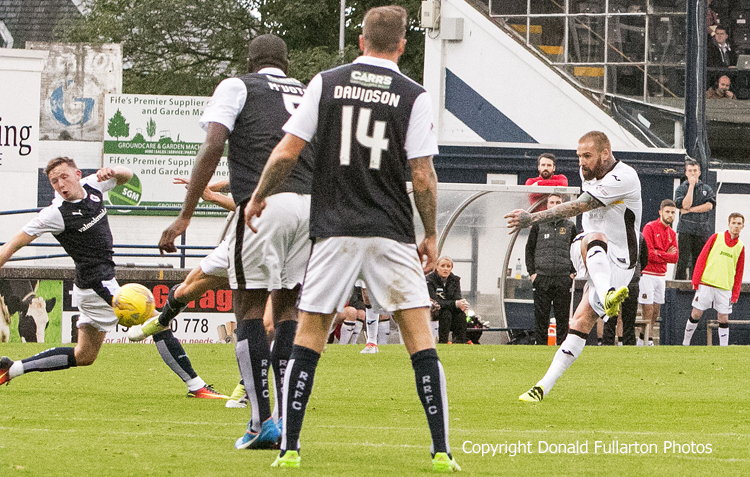 Despite a promising start, defensive frailties and a wonder goal saw Gary Locke's side 3-0 up at the interval. But things were to change. The hosts went ahead on the quarter hour, as Kevin McHattie found space down the left and finished smartly into the far corner for the opening goal. With half an hour on the clock Sons came agonisingly close to equalising. A free kick was whipped in and just put wide by Daniel Harvie on the near post. Then it all went wrong. Lax defending let in Ross Callachan, whose shot was deflected to wrongfoot Dumbarton keeper Alan Martin for 2-0. Shortly afterwards it was three. A stunning shot from Scott Roberts, on loan from Rangers, on the edge of the box crashed off the post and went into the top corner. In the second half Martin made a couple of good saves, while at the other end a Robert Thomson back-heel on goal was blocked and another effort held. Then on 71 minutes Dumbarton came back into the game. Good build-up play created an opportunity for sub Ryan Stevenson to hammer home from distance to make it 3-1 (pictured). Six minutes later Sons were right back in the match. Stevenson beat defender McHattie and passed to Robert Thomson who stabed in a second for the visitors. The closing spell was a desperate scramble by both sides to claim the spoils. In the end Raith held on to take all three points and Dumbarton's Gregor Buchanan was red-carded for a second bookable offence.